Epigenetics is the main mechanism that controls transcription of specific genes with no changes in the underlying DNA sequences. Epigenetic alterations lead to abnormal gene expression patterns that contribute to carcinogenesis and persist throughout disease progression. Because of the reversible nature, epigenetic modifications emerge as promising anticancer drug targets. Several compounds have been developed to reverse the aberrant activities of enzymes involved in epigenetic regulation, and some of them show encouraging results in both preclinical and clinical studies. In this article, we comprehensively review the up-to-date roles of epigenetics in the development and progression of prostate cancer. We especially focus on three epigenetic mechanisms: DNA methylation, histone modifications, and noncoding RNAs. We elaborate on current models/theories that explain the necessity of these epigenetic programs in driving the malignant phenotypes of prostate cancer cells. In particular, we elucidate how certain epigenetic regulators crosstalk with critical biological pathways, such as androgen receptor (AR) signaling, and how the cooperation dynamically controls cancer-oriented transcriptional profiles. Restoration of a “normal” epigenetic landscape holds promise as a cure for prostate cancer, so we concluded by highlighting particular epigenetic modifications as diagnostic and prognostic biomarkers or new therapeutic targets for treatment of the disease. The last two decades have witnessed a huge advance in our understanding of prostate cancer (PCa), which leads to the development of new therapeutic modalities including chemotherapy, immunotherapy, and novel hormonal reagents. Although better treatments have significantly improved life expectancy in patients, the disease remains the most common nondermatologic type of cancer and the third leading cause of cancer mortality in men in the United States. As a highly heterogeneous disease, PCa is driven by both genetic and nongenetic causes. Common genetic changes with well-defined roles in the disease include loss of heterozygosity (LOH) of p53 and phosphatase and tensin homolog deleted on chromosome 10 (PTEN) genes, fusion of transmembrane protease, serine 2 (TMPRSS2) promoter with external transcribed spacer (ETS) transcription factor genes, and mutations of speckle-type POZ protein (SPOP) gene. However, not all cases of prostate tumorigenesis can be explained by definitive driving genomic alterations. It is quite likely that other biological events precede and enforce the malignant transformation. Epigenetic alteration is one of such candidates. Epigenetics refers to any biological processes that modulate gene expression and subsequently control cell fate without affecting the actual DNA sequences. The topics that are currently covered in studies of epigenetics include DNA methylation, histone modifications, chromatin remodeling, and noncoding RNA processing. It has been shown that numerous epigenetic alterations appear to be highly recurrent, and sometimes nearly universal, in PCa. These alterations reinforce the establishment of a context-specific transcriptional profile that favors self-renewal, survival, and invasion of PCa cells. It has been demonstrated that accumulation of epigenetic aberrations eventually causes genetic or genomic instability. On the other hand, several genes encoding the enzymes that shape the epigenetic landscape are found mutated in PCa. Therefore, genetic mutations and epigenetic aberrations contribute individually and cooperatively to the pathogenesis and progression of PCa. In this review, we will spotlight functions of three epigenetic programs, i.e., DNA methylation, histone modifications, and noncoding RNAs, all of which have been comprehensively studied in prostate carcinogenesis and tumor progression. The purpose of this article is to systematically overview the evidences that support the theoretical foundation for epigenetic diagnosis, prognosis, and therapy in PCa. DNA methylation is a chemical reaction by which a methyl (-CH3) group is covalently attached to either cytosine or adenine of DNA molecules. This modification is catalyzed primarily by three members of DNA methyltransferase family: DNMT1, DNMT3A, and DNMT3B. It can be removed either passively on daughter strand after several rounds of DNA replication or actively by multiple enzymes like Ten-eleven translocation (TET) family proteins with the assistance of base excision repair (BER) pathway. DNA methylation is one of the most critical epigenetic regulatory mechanisms affecting gene expression potentials. High levels of methylation at promoter regions or around the transcription start sites (TSS) usually lead to transcriptional silencing. Several theories have been put forward to explain the correlation of promoter methylation with low gene expression. First, proteins that specifically bind to methylated DNA block chromatin accessibility of transcription factors required for gene induction. Alternatively, such transcription factors no longer recognize regulatory elements of target genes because of the modification. Besides, DNA methylation establishes a repressive and closed chromatin structure, as suggested by the insensitivity of the modified chromatin to nuclease digestion and significantly less acetylation of histone proteins assembled on it. On the other hand, DNA methylation is found to be enriched in intragenic regions as well, which has been shown to play a regulatory role in transcriptional elongation and alternative splicing. Particularly, gene bodies of highly transcribed genes are heavily methylated, and the methylation intensity is positively correlated with the levels of expression. This indicates a universal function of intragenic methylation in transcriptional activation. Emerging evidence suggests that the histone mark H3K36 trimethylation (H3K36me3), which is instructive for transactivation, facilitates gene body DNA methylation by docking the functional PWWP domain of DNMT3B and recruiting the DNA methyltransferase to targeted genomic sites., The PWWP domain is a 100-150 amino acid module that contains a highly conserved Pro-Trp-Trp-Pro motif. It functions to associate with chromatin and therefore is often found in many DNA-binding proteins. Spatial selectivity of DNA methylation and multiple mechanisms of action all indicate how critical this epigenetic machinery can be in terms of gene expression regulation; thus, any misregulation of this precise machinery may result in human diseases and disorders, such as cancers. Changes in DNA methylation landscape, either globally or locus specifically, have been indicated as one of the most recurrent events in advanced PCa [Figure 1]. This supports a causal role of these specific somatic alterations in driving neoplastic phenotypes and aggressive evolution of the disease. In mammals, DNA methylation predominantly occurs in the context of CpG dinucleotide, and merely 1% of human genome contains this dinucleotide due to spontaneous deamination of methylated CpG to TpG over time. The only exception of this global CpG under-representation is specific genomic regions enriched for GC sequences, which is termed CpG islands. In normal cells, promoter CpG islands are predominantly unmethylated. However, some of them get hypermethylated when cells become transformed or malignant. Consistent with its presumed function, hypermethylation of promoters coincides with transcriptional repression of downstream target genes, most of which are supposed to act as tumor suppressors. Figure 1: Alterations in DNA methylation patterns change expression of certain genes in PCa. Both DNA (a) hypermethylation and (b) hypomethylation are found in cancer cells. Effects of these changes in DNA methylation profiles on gene expression, chromatin structure, or transcriptional regulatory network are demonstrated as what the zoomed-in areas depicted. Genes that are transcriptionally modulated by each specific mechanism of DNA methylation in PCa are listed, categorized by the biological functions each representative gene may be involved in. PCa: prostate cancer; green bars: sites in unmethylated states; red bars: methylated sites. Glutathione S-transferase pi (GSTP1) is one of the genes that are heavily methylated at the promoter region and concomitantly shows loss of expression in prostate tumors. GSTP1 hypermethylation occurs in more than 90% of the clinical cases and presents at all stages during PCa progression. This finding has been repeatedly confirmed in independent samples by separate research groups,, which best exemplifies high recurrent rate of DNA hypermethylation at particular genomic loci. Hundreds of additional genes have been reported to contain hypermethylated promoters, such as O-methylguanine DNA methyltransferase (MGMT), cyclin-dependent kinase inhibitor 2A (CDKN2A), death-associated protein kinase (DAPK), and tissue inhibitors of metalloproteinases (TIMPS), just to name a few.,, These genes exert dynamic biological functions and are involved in a number of pivotal cellular pathways such as hormonal response, tumor cell invasion/metastasis, cell cycle control, apoptosis, and DNA damage repair. Nowadays, a clinical inspection called ConfirmMDX (MDxHealth) assesses methylation signals at promoters of three genes (GSTP1, adenomatous polyposis coli [APC], and Ras association domain family 1 [RASSF1]), which independently predicts PCa incidence relative to traditional parameters such as prostate-specific antigen (PSA) levels and digital rectal examination results. This test represents the first epigenetics-based diagnostic assay, and it helps minimize false-negative cases by inspecting prostate biopsies that initially show histopathologically cancer-free. Therefore, this testing solution improves patient risk stratification and avoids unnecessary screening procedures. The National Comprehensive Cancer Network (NCCN) has included this analysis in the guidelines for early PCa detection to ensure more efficient diagnoses and to improve clinical outcomes., Inspired by the proof of concept, scientists strive to develop new approaches utilizing DNA hypermethylation for PCa screening, and ProCam is one of such investigational tests. This assay evaluates the epigenetic modifications in GSTP1, retinoic acid receptor cDNA probe (RAR2), as well as APC, and preliminary results are very encouraging. More importantly, ProCam uses urine samples instead of needle biopsies, so it may be a noninvasive algorithm for the detection of PCa. In contrast to hypermethylation-mediated gene silencing, hypomethylation, which means demethylation of normally methylated DNA, contributes to gene overexpression. A distinctive feature of DNA hypomethylation in many malignancies is that loss of DNA methylation seems to be a genome-wide phenomenon rather than at individual genes. In 1987, Bedford and van Helden reported that the overall content of methylated DNA was significantly lower in metastatic prostate tumors compared to normal or benign hyperplastic tissues. This is the first study demonstrating a correlation between hypomethylation and metastatic potential of PCa. Ever since then, plenty of work indicates that global hypomethylation becomes more prominent as prostate tumors progress to advanced stages., For example, urokinase plasminogen activator (PLAU) is known to promote aggressive phenotypes of PCa cells., Its expression is significantly elevated in late-stage, hormone-refractory tumors., Coincidently, promoter of PLAU gene is extensively methylated in benign and early-stage PCa, whereas it gets demethylated in highly invasive malignant cells. This is a perfect exemplary correlation showing manipulation of gene expression and consequently cancer progression by one single epigenetic mechanism. DNA demethylation predominantly occurs in the intergenic and intronic areas, particularly at repeated sequences including the heterochromatic satellite DNA and interspersed transposable elements. It is postulated that DNA hypomethylation induces genomic instability and mutation events, thus contributing to oncogenesis and cancer progression. Histone proteins are the most important structural components of nucleosome, the fundamental chromatin unit. They are highly conserved and alkaline, so they tightly associate with the negatively charged DNA through a series of electrostatic interactions including hydrogen bonds and salt bridges. There are several regulatory mechanisms controlling the dynamic interaction between histone and DNA, one of which is the posttranslational modifications (PTMs) of histone proteins. Various types of covalent modifications have been detected at specific amino acids on histones, including acetylation, methylation, phosphorylation, ADP-ribosylation, and ubiquitination. These enzyme-assisted modifications primarily occur at the N-terminal tails of the histones. The added moieties can affect the charge properties of the histone, thus loosening or tightening the condensed nucleosome structure. These chemical groups can also help decoy other proteins that specifically recognize the modified residues. The recruitment results in alterations of chromatin environment, so that the cis-regulatory elements become more closed or more accessible. Modifications of histones can have very profound influence on every DNA-associated process, such as packaging, transcription regulation, replication, recombination, and repair. For this reason, posttranslational modifications of histone proteins are also called histone codes in analogy to genetic code, as they add an extra layer of complexity to cellular phenotypes that were originally thought to be predominantly determined by DNA sequences. Increasing evidence suggests involvement of histone modifications in the onset and progression of PCa. Distinct types of modifications, especially methylation and acetylation, show differential intensities between normal and cancerous samples. For example, one study evaluated methylation of H3K4 and H3K9 as well as pan-acetylation of H3 and H4 by immunohistochemistry in a tissue microarray containing 23 nonmalignant and 113 adenocarcinoma samples. Di- and trimethylation of H3K9 and acetylation of H3 and H4 were all significantly reduced in cancer tissues. In contrast, all three methylation states of H3K4 were upregulated in androgen-independent tumors and correlated with clinical–pathological parameters. These findings suggest that changes in the overall intensity of certain histone modification may be closely associated with cancer and that they are predictive of clinical outcomes. In an independent report, levels of acetylated H3K9, H3K18, and H4K12 and dimethylated H4R3 and H4K4 were analyzed in 183 primary PCa tissues. 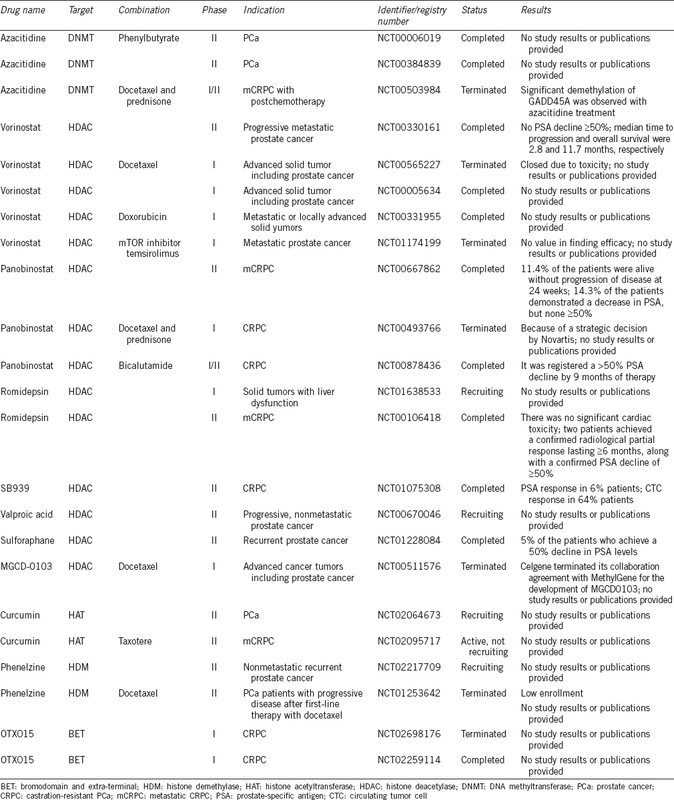 Remarkably, patterns of all these five modifications in combine stratified patients into groups showing differential risks of 10-year tumor recurrence. Interestingly, different numbers of the same moiety on particular histone residue may display distinct immunohistochemical signals at different stages of PCa. For instance, comparably strong staining of H4K20 trimethylation was observed in normal, localized as well as metastatic, hormone-naïve tumors, whereas castration-resistant tissues showed the weakest levels of mono- and dimethylation. In addition, monomethylation signal was significantly correlated with lymph node metastases, while dimethylation correlated with the Gleason score. Other histone marks that have been investigated in prostate tumorigenesis include H3K18 acetylation and H3K27 methylation. In a cohort of 279 PCa cases, Kaplan–Meier analysis showed a significant association between levels of acetylated H3K18 and increased risk of tumor relapse. Intensities of H3K27 mono- and trimethylation have been reported to positively correlate with aggressive tumor features., Strikingly, concentrations of H3K27me3 could be detected in cell-free circulating nucleosome from peripheral blood of patients by an enzyme-linked immunosorbent assay (ELISA). They were significantly lower in men with metastatic disease than in those with localized or local advanced tumors. All these studies convincingly demonstrate that changes in global levels of certain histone-modifying events are associated with increased risks of PCa recurrence and poor survival. However, most of the indications were based on immunostaining assays that heavily depend on the quality of the antibodies for data interpretation, and it is still deliberative as for how individual histone codes change in PCa. Even so, cumulative evidence implies that patterns of histone modifications may distinguish cancer cells from their normal counterparts or metastatic disease from organ-confined tumors. All the studies that demonstrate such differential intensities of certain histone codes are summarized in [Table 1]. Therefore, epigenetic patterns of histone modifications, especially methylation and acetylation, may function as promising biomarkers for PCa diagnosis and prognosis. Although being less characterized than methylation or acetylation, other types of histone modifications are also indicated in PCa development and progression. Phosphorylation of histone variant H2AX at Ser139 has been confirmed in multiple PCa cell lines, and this posttranslational modification helps recruit essential components for DNA damage repair at sites containing double-strand breaks (DSB) and activate checkpoint proteins for cell cycle arrest. Monoubiquitination of H2A was noticeably lower in prostate tumors compared to the paired normal tissues, while monoubiquitination of H2B at K120 has been indicated in the control of self-renewal property of PCa stem cells. In general, alterations in a particular histone mark directly reflect the aberrant expressions or activities of the enzymes that orchestrate this epigenetic program. Approximately 50% of the histone methyltransferases encoded by the human genome, for instance, are now linked to diseases and in particular to cancer. It is intriguing to find that a lot of these protein enzymes are involved in activation of critical signaling pathways in PCa, which will be elaborated in a latter section. This further supports an indispensible role of epigenetics in regulation of central signaling driving prostate carcinogenesis and tumor progression. Noncoding RNAs (ncRNAs) are evolutionarily conserved RNA molecules that are transcribed from DNAs but not translated into proteins. Over years, there are heated debates regarding biological significance of these transcripts. ncRNAs were initially considered as byproducts of excessive activity of RNA polymerase II and therefore arisen from transcriptional noise. Now, a plethora of research has demonstrated that individual ncRNAs are involved in a variety of fundamental biological processes, such as translation, RNA splicing, and DNA replication. Most importantly, studies find mutations, abnormal expression levels, or imbalanced supply of certain ncRNAs, which can cause human diseases including PCa. ncRNAs can be classified into small (sncRNAs) and long (lncRNAs) groups, depending on their molecular lengths. sncRNAs, in general, are <200 nucleotides. Based on their structural features and distinguishable functions, sncRNAs can further be categorized into microRNA (miRNA), small-interfering RNA (siRNA), small nuclear RNA (snRNA), and piwi-interacting RNA (piRNAs). The best-characterized type of sncRNAs in cancers is microRNAs (miRNAs), which act to block protein syntheses through either mRNA cleavage or translational inhibition. A large number of studies have been carried out to determine miRNA profiles in PCa., Both oncogenic and tumor suppressor miRNAs have been identified, so aberrations of their expression levels contribute to prostate pathogenesis and promote the malignant properties. For instance, miR-221/222 are commonly upregulated in PCa. They boost growth of both prostate carcinoma cells and xenografts by blocking expression of cyclin-dependent kinase inhibitor p27kip1, which results in cell cycle progression at G1-to-S phase. On the other hand, downregulation of miR-145 has been observed in PCa. Its decrease is related to more advanced tumor grades and higher risks of biochemical recurrence. One of the targets of miR-145 is Fascin homolog 1 (FSCN1), an actin-binding protein that increases invasiveness of cancer cells and facilitates immune suppression. This in part explains why miR-145 inhibits proliferation, migration, and invasion of PCa cells. Another miRNA molecule that has been repeatedly indicated in tumor suppression is miR-34a. In nearly 80% of primary prostate carcinomas, the promoter of MIR34A gene is methylated. Hence, miR-34a expression is decreased in PCa, particularly in CD44-positive cell population that possess tumor-initiating properties. CD44 is a direct target of miR-34a, so overexpression of this miRNA inhibited clonogenic capacity, halted tumor growth, and blocked metastasis of CD44+ PCa cells. This study strongly suggests that miR-34a is a promising therapeutic agent against prostate cancer stem cells. Just like the abovementioned cases, multiple miRNAs show differential expression patterns in normal versus cancer cells, and their levels correlate well with pathological statuses of prostate tumors or clinical behaviors of cancer patients. In particular, miRNAs are chemically stable in fresh or even formalin-fixed tissues, and they have even been detected in many biological fluids, such as serum, urine, blood, and saliva. All of these features make microRNAs highly promising as excellent biomarkers. miRNA profiling in PCa is warranted though, since outcomes of miRNA expression in clinical samples are conflicting from study to study, and no clear-cut miRNA panel has been defined. ncRNAs that are longer than 200 nucleotides are defined as lncRNAs, and they regulate gene expression in both cis-acting and trans-acting modes. In detail, when the genomic location of lncRNA lies in close proximity to, or even within, the protein-coding target loci, transcriptional interference occurs so that elongation of lncRNA transcript suppresses initiation of adjacent transcription. Alternatively, lncRNAs regulate gene expression in cis by direct binding to regulatory DNA elements nearby and leading to either dissociation of the preinitiation complex or coating of the chromatin region. lncRNAs can also control distal transcriptional events in trans via crosstalk with RNA polymerases, transcription factors, or epigenetic regulators. Formation of the ribonucleoprotein complex may change subcellular localization or enzymatic activities of bound proteins.,, Taken together, lncRNAs-mediated transcriptional regulation is extremely context specific and renders diverse biological consequences, so both oncogenic and tumor-suppressive functions have been implied for various lncRNA molecules. The lncRNA prostate cancer antigen (PCA3) is one of the first lncRNAs that are identified to be highly specific for prostate cancer., Its level is dramatically elevated in more than 95% of prostatic tumors and can be detected even in a small chunk of specimens that contained <10% PCa cells. Now, it is feasible to determine PCA3 amount in urinary samples, and a nucleic acid sequence-based amplification assay, called uPM3, was then developed in such clinical setting. This assay uses a primer-dependent technology to continuously amplify PCA3 RNA under isothermal conditions., The quantitative score reliably predicted the incidence of prostate carcinogenesis when combined with other clinical information including prostate volume, PSA level, inflammation, or patient's age. These findings provide the fundamental basis for clinical application of PCA3 as a useful biomarker for PCa diagnosis. In 2012, Progensa™ PCA3 urine test was approved by the US Food and Drug Administration (FDA), which helps determine the need for repeat prostate biopsies in men who had previous negative results. In addition, PCA3 modulates expression of multiple genes that are involved in a variety of important biological processes such as angiogenesis, epithelial–mesenchymal transition (EMT), cell adhesion, and apoptosis. Consequently, overexpression of the lncRNA PCA3 induces cell proliferation and drives PCa progression. Therefore, PCA3 has also been suggested as a therapeutic target for advanced PCa. Another prostate-specific lncRNA is called second chromosome locus associated with prostate-1 (SChLAP1). Emerging evidence suggests that SChLAP1 may serve as a prognostic biomarker, since SChLAP1 expression is pronouncedly elevated in patients treated with radical prostatectomy, which independently predicts biochemical recurrence and chances of cancer-related mortality. Mechanistically, SChLAP1 interacts with SNF5, a crucial subunit of SWItch/sucrose nonfermentable (SWI/SNF) complex, disrupts the chromatin recruitment of this complex, and counteracts the tumor-suppressive effect of SWI/SNF. Prostate cancer gene expression marker 1 (PCGEM1) is also a prostate-specific lncRNA, which is exclusively expressed in glandular epithelial cells of human prostate. Its level is induced by the male hormone androgen, increased in 56%−84% of PCa compared with matched normal specimens, and tends to associate with high-risk PCa patients., Overexpression of PCGEM1 promoted cell proliferation and colony-forming potential of PCa cells, implying an oncogenic function of this lncRNA in PCa. Numerous other lncRNAs have been implicated in prostate carcinogenesis and tumor progression, such as focally amplified lncRNA in epithelial cancer (FALEC), which is induced in a hypoxic environment and functionally enhances proliferation, migration, and invasion of PCa cell; PCa associated transcript 1 (PCAT1), which post-transcriptionally upregulates c-MYC by interfering with miRNA-mediated inactivation of the oncogene. The numbers of lncRNAs that contribute to malignant properties of PCa cells keep growing. Besides the above-mentioned examples, we provide a relatively complete list in [Table 2]. In summary, noncoding RNAs have dynamic roles in transcriptional regulation and are involved in a variety of biological processes, all together leading to the development of pathogenesis of PCa. Most recently, a cell-derived microvesicle, called exosome, was found to serve as a critical communicating messenger between cells. Accumulating evidence indicates that exosomes from tumor microenvironment play key roles in regulation of PCa cell survival, proliferation, metastases, angiogenesis, and immune surveillance., Exosome is 30-100 nm in size, composed of lipid bilayer membrane, and encapsulates bioactive molecules including ncRNAs. Several work characterized the ncRNAs content in exosomes that are released by PCa cells. One report investigated the levels of 742 miRNAs in serum-derived circulating microvesicles from 78 PCa patients and 28 normal individuals. Interestingly, miR-375 and miR-141 were significantly enriched in exosomes from patients with metastases compared with those without recurrent PCa. Another study found a specific group of lncRNAs abundantly present in PCa exosomes, which harbor perfect binding sites for the seed regions of highly expressed miRNAs. Due to the strong association of specific exosomal RNA biomarkers with PCa, Exosome Diagnostics Inc. launched a urine-based assay called ExoDx® Prostate (IntelliScore) to measure the exosomal expression of ERG, PCA3, and SPDEF. The gene expression score in combination with results of standard-of-care tests represents a more accurate way of discriminating high-grade PCa from low-grade or benign disease and significantly expedites the biopsy decision-making process. Tremendous efforts are ongoing to exploit certain ncRNAs for diagnosis and prognosis of PCa, and scientists attempt to develop minimally invasive procedures in circulating tumor cells, cell-free DNAs, or extracellular vesicles to detect these epigenetic biomarkers. Signaling pathway is a hierarchical network that controls cell functions by a series of molecules working together. It is a fundamental mechanism of cell growth, metabolism, division, and other molecular processes. One of the most critical signaling in PCa is the action of the steroid hormone receptor protein, androgen receptor (AR). It is now widely accepted that AR plays a pivotal role in normal development and malignant transformation of prostate epithelial cells. Misregulation of AR signaling has been identified in almost every step of PCa initiation and progression, for instance, AR gene mutations and amplification; aberrant AR activity by unbalanced interaction with its cofactors; and upregulation of constitutively active AR splice variants. Loss of AR protein expression has been seen in as many as 20%−30% of androgen-independent tumors, which is partly attributed to epigenetic silencing by promoter hypermethylation., Although the frequency of AR promoter methylation in general appears to be low, this type of epigenetic regulation seems to be more prevalent in castration-resistant PCa (CRPC). It increases from 0−20% incidence in untreated primary cancer to 13%–28% in hormone-refractory tissues. It is thus highly clinical relevant to identify this AR-negative subgroup of PCa, and implication of DNA methylation in mediating downregulation of AR expression will have a profound effect on the treatment regimens for the metastatic, hormone-refractory PCa. A lot of histone marks as well as the corresponding enzymes are intimately participated in regulating AR competency. Accumulating data from chromatin immunoprecipitation (ChIP) assays shows that acetylated histone H3 colocalizes with AR binding sites and potentiates transactivation of the androgen-responsive genes. Epigenetic regulatory proteins that recognize this specially modified histone play key roles in regulation of AR-dependent transcriptional profiles. For example, the bromodomain-containing protein 4 (BRD4), which binds to acetylated lysine residues on histones through the structural module bromodomain, associates with AR, facilitates recruitment of this nuclear receptor to its target loci, and therefore contributes to the aggressive phenotypes of PCa cells. Lysine-specific histone demethylase 1A (KDM1A), which specifically demethylates mono- and dimethylated H3K4 and K9, resides in a complex with AR to drive transcription of androgen-dependent genes. Higher expression of the demethylase is associated with poorer outcome in primary PCa patients., Likewise, lysine-specific demethylase 4C (KDM4C) also forms complexes with AR to stimulate androgen-dependent growth of PCa cells, suggesting that KDM4C may contribute to prostate tumorigenesis as well. Another epigenetic enzyme that has been repeatedly implied in regulation of AR signaling is the methyltransferase enhancer of zeste homolog 2 (EZH2), which is the catalytic subunit of the polycomb repressive complex 2 (PRC2) and methylates H3K27. It was found to serve as an AR coregulator and orchestrates AR-regulated gene signatures that either block nonprostatic differentiation or promote cell cycle progression. Monoubiquitination of histone H2B at K120 got increased upon androgen stimulation within the transcribed regions of AR target genes, and this increment was coupled to the enhanced proliferation of PCa cells. Growing body of evidence documents an important role of noncoding RNAs in modulating AR activity. Genome-wide screening of transcriptional changes identified large numbers of noncoding transcripts being induced or suppressed upon androgen stimulation, such as miR-125b, miR-21, and PCAT29.,, These molecules then carry out a series of gene expression regulations or interact with various transcription (co)factors, cascading down the androgen-AR axis. Reciprocally, a plethora of ncRNAs directly manipulates expression of AR. It is not surprising that both transcript and protein levels of AR are suppressed by several miRNAs, such as miR-145 and miR-205. The suppression is mediated by direct binding of miRNAs to the 3'-UTR of AR gene and dependent on the Argonaute protein, which is the active component of the RNA-induced silencing complex (RISC) cleaving the target mRNA strand. On the other hand, the lncRNA PlncRNA-1 sponges these AR-targeting miRNAs and masks the miRNA-response elements in AR transcript by serving as a competing endogenous RNA (ceRNA). As a result, PlncRNA-1 promotes PCa growth by upregulating AR expression. Interestingly, the most common splice variant of AR, AR-v7, is transcriptionally governed by ncRNAs as well. Two lncRNAs, metastasis-associated lung adenocarcinoma transcript 1 (MALAT-1) and PCGEM1, are reported to increase expression of v7. They directly interacted with the spliceosome-associated factors SF2 and U2AF65, respectively, and subsequently enhanced the binding capacity of these factors with AR pre-mRNA. Considering the strong linkage of AR-v7 to the aggressive and treatment-resistant phenotypes of PCa cells, inhibition of lncRNAs represents appealing therapeutic strategy for advanced, late-stage disease. Not only acting to regulate AR level, both small and long ncRNAs may also influence competency of AR signaling via direct crosstalk with either the nuclear receptor itself or coregulators. One of the paradigms in such scenarios is the lncRNA HOX transcript antisense intergenic RNA (HOTAIR). This 2.2-kb long transcript was demonstrated to serve as a scaffold for both polycomb repressive complex 2 (PRC2) and lysine-specific demethylase 1 (LSD1)/REST corepressor (CoREST)/REST using 5' and 3' domains of the lncRNA, respectively. This enables the assembly of both histone-modifying complexes and leads to coordinated regulation of histone marks. Considering the profound impact that EZH2 and LSD1 have on AR activity, it is plausible that HOTAIR orchestrates the epigenetic landscape flanking AR binding locations and therefore facilitates the formation of a welcoming chromatin environment to assist AR-DNA interaction. Recently, HOTAIR was found to physically interact with AR, block the docking site for the E3 ubiqutin ligase murine double minute 2 (MDM2), and thereby prevent AR from degradation. As a consequence, AR was accumulated so abundantly that it induced transactivation even in the absence of androgen. In summary, a hierarchical network of ncRNAs, which can be regulated by androgen, in return can control both expression levels and transcriptional activity of AR. In addition to androgen-AR axis, epigenetic programs play vital roles in activation of other biologically important signaling that is involved in cancer stem cell self-renewal, EMT transition, angiogenesis, etc., such as Wnt/β-catenin, phosphatidylinositol-3 kinase (PI3K)/protein kinase B (Akt), and Hedgehog pathways. Ligand productions or expressions of any auxiliary proteins along the signaling axes can be modulated by particular epigenetic mechanisms. Direct crosstalk between epigenetic machinery and the master transcription (co)factors determines the downstream cascade of biological effects. Meanwhile, epigenetic regulatory proteins are frequently targets of, or posttranslationally modified by, one of these signaling pathways. All in all, signal circuits and epigenetic network are interwoven with each other, constituting a complex and hierarchical feedback loop. A panel of small molecule inhibitors of the enzymes that regulate histone codes are currently under intensive evaluation to assess their anticancer potentials. Several EZH2 inhibitors that selectively block its methyltransferase activity have been developed and they all demonstrated dose-dependent inhibition of H3K27me3 without triggering EZH2 protein degradation.,, Some of them are currently under clinical trials in patients with hematologic malignancies. Because both H3K27me3-dependent and H3K27me3-independent mechanisms were indicated in mediating the antitumor effects of EZH2, the mechanism of drug action in PCa cells needs further investigation., Bromodomain-containing proteins, especially the bromodomain and extra-terminal motif (BET) family members, represent another resourceful repertoire of epigenetic drug targets. BET inhibitors, such as JQ1, I-BET151, and I-BET762, destroy interaction between BET domain and modified residues, affect a large variety of biological processes, and demonstrate promising outcomes in early clinical trials. In terms of PCa, JQ1 exhibited a drastic antineoplastic activity particularly in castration-resistant cells by abolishing BRD4-mediated chromatin recruitment of AR and transactivation. OTX015, a derivative of JQ1, is a novel orally bioavailable inhibitor of BRD2, BRD3, and BRD4. It exhibited significant synergism, together with AR antagonists, in inhibiting the growth of metastatic, hormone-refractory cells. Intriguingly, administration of OTX015 potently diminished PCa stem cell population in sphere-forming assays, providing a compelling strategy for the treatment of the most aggressive PCa cells that seed the bulky disease. Another group of epigenetic drug precursors that have been extensively studied is the inhibitors of histone demethylase LSD1. Several highly selective LSD1 inhibitors have been identified recently, such as NCL-1, HCI-2509, and namoline.,, All of these lead compounds are potent, reversible, and selective in terms of impairing H3K4-demethylating activity. They suppressed the androgen-independent growth of CRPC cells both in vitro and in vivo with no apparent adverse effects., Pan-demethylase inhibitors have also been designed and synthesized. Several of them caused growth arrest and substantial apoptosis in cancer cells including prostate, but had little effects on nonmalignant cells. Finally, two clinical trials are currently being conducted with phenelzine sulfate, a potent inhibitor of monoamine oxidase (MAO) that is closely homologous to LSD1, and therefore the prototype drug is considered as a nonspecific inhibitor of the demethylase. In these trials, the lead agent was administered either alone to treat patients with relapsed PCa that has not metastasized (NCT02217709) or in combination with docetaxel for progressive PCa cases after first-line therapy with docetaxel (NCT01253642). 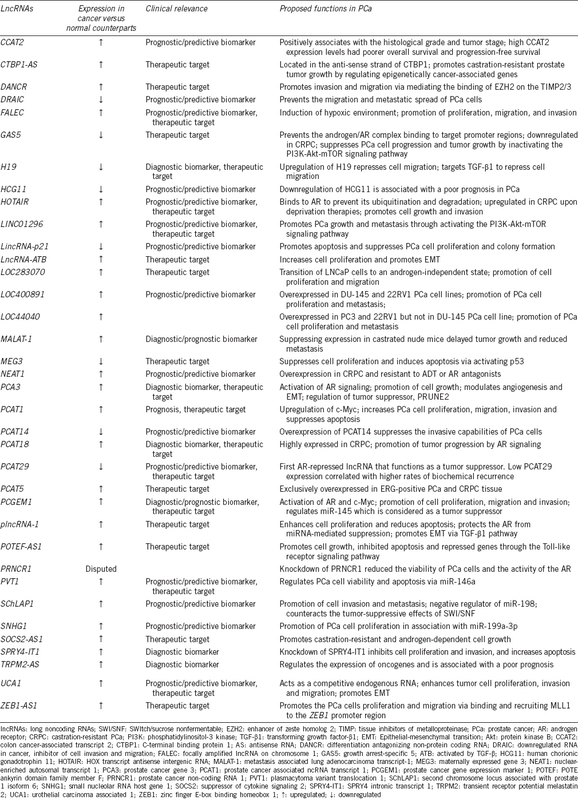 [Table 3] lists all the ongoing or terminated clinical trials testing epigenetic drugs that target either DNA methylation or certain histone-modifying enzymes in PCa. As for ncRNAs, a phase I clinical trail (NCT01829971) was launched in April 2013 by Mirna Therapeutics (Austin, TX, USA) to evaluate the anticancer potential of a liposome-formulated miR-34a mimic (MRX34). This was the first attempt to use a miRNA as an innovative therapy for cancer, and a lot of hindrances still exist regarding the clinical application of ncRNAs, such as the optimal way of delivery, the potential side effects, and therapeutic regimen management. There has been a recent explosion of interest in utilizing exosome as a delivery vector of therapeutic molecules, such as miRNAs, to target PCa. For example, exosomes that were released from adipose-derived stromal cells carried and unloaded miR-145 into the cocultured PCa cells. The cargo then inhibited PCa cell proliferation and induced apoptosis, possibly via downregulation of anti-apoptotic protein Bcl-xL. This proof-of-principle study implied an encouraging clinical application of exosomes as a pharmaceutical formulation for epigenetic drugs. Even though most of the drugs targeting certain epigenetic marks are still in preclinical or early phase trial stages, it is appealing to screen for novel compounds that achieve robust inhibition of aberrant epigenetic codes for cancer therapy. It is now generally accepted that epigenetics contributes to the development of nearly every stage of PCa. Targeting certain epigenetic mechanism may represent an alternative approach to current prevalent treatment. More work is warranted to gain deeper understanding of the roles of epigenetic modifications in control of cancer-specific gene expression, the crosstalk among various epigenetic marks, and the close cooperation with critical signaling pathways. Increased insights into these epigenetic regulatory mechanisms will definitely foster successful clinical applications of epigenetic codes as biomarkers of cancer risk stratification, to predict therapy response, or to provide alternative treatment options for PCa. Epigenetic therapy is still in its infancy and there is a long way to go for the goal of personalized medicine. There are several factors that hinder the initiatives of applying epigenetic drugs in clinical practice. First, the biological functions of majority of the above-discussed epigenetic enzymes have not been fully elucidated or validated. Considering the highly heterogeneous nature of PCa, it is quite likely that effect of a particular epigenetic pattern on growth of cancer cells varies from case to case and context specific. Second, besides the problem of identifying druggable targets, another challenge is to explore the mechanisms of action and the pharmacological behavior of any epigenetic drugs. Lack of success in clinical trials that test tool compounds targeting epigenetic programs in PCa raises the concerns about their potencies, specificities, and side effects. This can possibly be due to misses of molecular readouts that authentically reflect the effectiveness of the drug or biomarkers that can be used to properly stratify patients. Despite of all these difficulties, with breakthroughs in technologies precisely mapping particular epigenetic marks, with appearance of new paradigms of medicinal chemistry, and with more comprehensive knowledge of epigenetic functions, the future of epigenetic therapy is bright. Massenkeil G, Oberhuber H, Hailemariam S, Sulser T, Diener PA, et al. P53 mutations and loss of heterozygosity on chromosomes 8p, 16q, 17p, and 18q are confined to advanced prostate cancer. Anticancer Res 1994; 14: 2785–90. Phin S, Moore MW, Cotter PD. Genomic rearrangements of PTEN in prostate cancer. Front Oncol 2013; 3: 240. Boysen G, Barbieri CE, Prandi D, Blattner M, Chae SS, et al. SPOP mutation leads to genomic instability in prostate cancer. Elife 2015; 4. pii: e09207. Holliday R. Epigenetics: an overview. Dev Genet 1994; 15: 453–7. Kumar S, Cheng X, Klimasauskas S, Mi S, Posfai J, et al. The DNA (cytosine-5) methyltransferases. Nucleic Acids Res 1994; 22: 1–10. Ikeda Y, Kinoshita T. DNA demethylation: a lesson from the garden. Chromosoma 2009; 118: 37–41. Chomet PS. Cytosine methylation in gene-silencing mechanisms. Curr Opin Cell Biol 1991; 3: 438–43. Curradi M, Izzo A, Badaracco G, Landsberger N. Molecular mechanisms of gene silencing mediated by DNA methylation. Mol Cell Biol 2002; 22: 3157–73. Jones PA. Functions of DNA methylation: Islands, start sites, gene bodies and beyond. Nat Rev Genet 2012; 13: 484–92. Jones PA. The DNA methylation paradox. Trends Genet 1999; 15: 34–7. Baubec T, Colombo DF, Wirbelauer C, Schmidt J, Burger L, et al. Genomic profiling of DNA methyltransferases reveals a role for DNMT3B in genic methylation. Nature 2015; 520: 243–7. Morselli M, William AP, Barbara M, Kevin N, Roberto F, et al. In vivo targeting of de novo DNA methylation by histone modifications in yeast and mouse. Elife 2015; 4: e06205. Luo JH, Ding Y, Chen R, Michalopoulos G, Nelson J, et al. Genome-wide methylation analysis of prostate tissues reveals global methylation patterns of prostate cancer. Am J Pathol 2013; 182: 2028–36. Henrique R, Jerónimo C. Molecular detection of prostate cancer: a role for GSTP1 hypermethylation. Eur Urol 2004; 46: 660–9, discussion 669. Millar DS, Ow KK, Paul CL, Russell PJ, Molloy PL, et al. Detailed methylation analysis of the glutathione S-transferase pi (GSTP1) gene in prostate cancer. Oncogene 1999; 18: 1313–24. Bastian PJ, Yegnasubramanian S, Palapattu GS, Rogers CG, Lin X, et al. Molecular biomarker in prostate cancer: the role of CpG island hypermethylation. Eur Urol 2004; 46: 698–708. Maruyama R, Toyooka S, Toyooka KO, Virmani AK, Zöchbauer-Müller S, et al. Aberrant promoter methylation profile of prostate cancers and its relationship to clinicopathological features. Clin Cancer Res 2002; 8: 514–9. Yamanaka M, Watanabe M, Yamada Y, Takagi A, Murata T, et al. Altered methylation of multiple genes in carcinogenesis of the prostate. Int J Cancer 2003; 106: 382–7. Padar A, Sathyanarayana UG, Suzuki M, Maruyama R, Hsieh JT, et al. Inactivation of cyclin D2 gene in prostate cancers by aberrant promoter methylation. Clin Cancer Res 2003; 9: 4730–4. Partin AW, Van Neste L, Klein EA, Marks LS, Gee JR, et al. Clinical validation of an epigenetic assay to predict negative histopathological results in repeat prostate biopsies. J Urol 2014; 192: 1081–7. Van Neste L, Groskopf J, Grizzle WE, Adams GW, DeGuenther MS, et al. Epigenetic risk score improves prostate cancer risk assessment. Prostate 2017; 77: 1259–64. Baden J, Adams S, Astacio T, Jones J, Markiewicz J, et al. Predicting prostate biopsy result in men with prostate specific antigen 2.0 to 10.0 ng/ml using an investigational prostate cancer methylation assay. J Urol 2011; 186: 2101–6. Bedford MT, van Helden PD. Hypomethylation of DNA in pathological conditions of the human prostate. Cancer Res 1987; 47: 5274–6. Santourlidis S, Florl A, Ackermann R, Wirtz HC, Schulz WA. High frequency of alterations in DNA methylation in adenocarcinoma of the prostate. Prostate 1999; 39: 166–74. Schulz WA, Elo JP, Florl AR, Pennanen S, Santourlidis S, et al. Genomewide DNA hypomethylation is associated with alterations on chromosome 8 in prostate carcinoma. Genes Chromosomes Cancer 2002; 35: 58–65. Dong Z, Saliganan AD, Meng H, Nabha SM, Sabbota AL, et al. Prostate cancer cell-derived urokinase-type plasminogen activator contributes to intraosseous tumor growth and bone turnover. Neoplasia 2008; 10: 439–49. Li Y, Cozzi PJ. Targeting uPA/uPAR in prostate cancer. Cancer Treat Rev 2007; 33: 521–7. Helenius MA, Saramäki OR, Linja MJ, Tammela TL, Visakorpi T. Amplification of urokinase gene in prostate cancer. Cancer Res 2001; 61: 5340–4. Helenius MA, Savinainen KJ, Bova GS, Visakorpi T. Amplification of the urokinase gene and the sensitivity of prostate cancer cells to urokinase inhibitors. BJU Int 2006; 97: 404–9. Pakneshan P, Xing RH, Rabbani SA. Methylation status of uPA promoter as a molecular mechanism regulating prostate cancer invasion and growth in vitro and in vivo. FASEB J 2003; 17: 1081–8. Ellinger J, Kahl P, von der Gathen J, Rogenhofer S, Heukamp LC, et al. Global levels of histone modifications predict prostate cancer recurrence. Prostate 2010; 70: 61–9. Seligson DB, Horvath S, Shi T, Yu H, Tze S, et al. Global histone modification patterns predict risk of prostate cancer recurrence. Nature 2005; 435: 1262–6. Behbahani TE, Kahl P, von der Gathen J, Heukamp LC, Baumann C, et al. Alterations of global histone H4K20 methylation during prostate carcinogenesis. BMC Urol 2012; 12: 5. Bianco-Miotto T, Chiam K, Buchanan G, Jindal S, Day TK, et al. Global levels of specific histone modifications and an epigenetic gene signature predict prostate cancer progression and development. Cancer Epidemiol Biomarkers Prev 2010; 19: 2611–22. Ngollo M, Lebert A, Dagdemir A, Judes G, Karsli-Ceppioglu S, et al. The association between histone 3 lysine 27 trimethylation (H3K27me3) and prostate cancer: relationship with clinicopathological parameters. BMC Cancer 2014; 14: 994. Ellinger J, Kahl P, von der Gathen J, Heukamp LC, Gütgemann I, et al. Global histone H3K27 methylation levels are different in localized and metastatic prostate cancer. Cancer Invest 2012; 30: 92–7. Deligezer U, Yaman F, Darendeliler E, Dizdar Y, Holdenrieder S, et al. Post-treatment circulating plasma BMP6 mRNA and H3K27 methylation levels discriminate metastatic prostate cancer from localized disease. Clin Chim Acta 2010; 411: 1452–6. Ide H, Nakagawa T, Terado Y, Yasuda M, Kamiyama Y, et al. DNA damage response in prostate cancer cells after high-intensity focused ultrasound (HIFU) treatment. Anticancer Res 2008; 28: 639–43. Zhu P, Zhou W, Wang J, Puc J, Ohgi KA, et al. A histone H2A deubiquitinase complex coordinating histone acetylation and H1 dissociation in transcriptional regulation. Mol Cell 2007; 27: 609–21. Crea F, Clermont PL, Mai A, Helgason CD. Histone modifications, stem cells and prostate cancer. Curr Pharm Des 2014; 20: 1687–97. Cohen I, Poreba E, Kamieniarz K, Schneider R. Histone modifiers in cancer: friends or foes? Genes Cancer 2011; 2: 631–47. Palazzo AF, Lee ES. Non-coding RNA: what is functional and what is junk? Front Genet 2015; 6: 2. Shahrouki P, Larsson E. The non-coding oncogene: a case of missing DNA evidence? Front Genet 2012; 3: 170. Lu J, Getz G, Miska EA, Alvarez-Saavedra E, Lamb J, et al. MicroRNA expression profiles classify human cancers. Nature 2005; 435: 834–8. Ambs S, Prueitt RL, Yi M, Hudson RS, Howe TM, et al. Genomic profiling of microRNA and messenger RNA reveals deregulated microRNA expression in prostate cancer. Cancer Res 2008; 68: 6162–70. Galardi S, Mercatelli N, Giorda E, Massalini S, Frajese GV, et al. miR-221 and miR-222 expression affects the proliferation potential of human prostate carcinoma cell lines by targeting p27Kip1. J Biol Chem 2007; 282: 23716–24. Avgeris M, Stravodimos K, Fragoulis EG, Scorilas A. The loss of the tumour-suppressor miR-145 results in the shorter disease-free survival of prostate cancer patients. Br J Cancer 2013; 108: 2573–81. Fuse M, Nohata N, Kojima S, Sakamoto S, Chiyomaru T, et al. Restoration of miR-145 expression suppresses cell proliferation, migration and invasion in prostate cancer by targeting FSCN1. Int J Oncol 2011; 38: 1093–101. Liu C, Kelnar K, Liu B, Chen X, Calhoun-Davis T, et al. The microRNA miR-34a inhibits prostate cancer stem cells and metastasis by directly repressing CD44. Nat Med 2011; 17: 211–5. Backes C, Meese E, Keller A. Specific miRNA disease biomarkers in blood, serum and plasma: challenges and prospects. Mol Diagn Ther 2016; 20: 509–18. Martens JA, Laprade L, Winston F. Intergenic transcription is required to repress the Saccharomyces cerevisiae SER3 gene. Nature 2004; 429: 571–4. Martianov I, Ramadass A, Serra Barros A, Chow N, Akoulitchev A. Repression of the human dihydrofolate reductase gene by a non-coding interfering transcript. Nature 2007; 445: 666–70. Chaumeil J, Le Baccon P, Wutz A, Heard E. A novel role for Xist RNA in the formation of a repressive nuclear compartment into which genes are recruited when silenced. Genes Dev 2006; 20: 2223–37. Feng J, Bi C, Clark BS, Mady R, Shah P, et al. The Evf-2 noncoding RNA is transcribed from the Dlx-5/6 ultraconserved region and functions as a Dlx-2 transcriptional coactivator. Genes Dev 2006; 20: 1470–84. Willingham AT, Orth AP, Batalov S, Peters EC, Wen BG, et al. A strategy for probing the function of noncoding RNAs finds a repressor of NFAT. Science 2005; 309: 1570–3. Nguyen VT, Kiss T, Michels AA, Bensaude O. 7SK small nuclear RNA binds to and inhibits the activity of CDK9/cyclin T complexes. Nature 2001; 414: 322–5. Schalken JA, Hessels D, Verhaegh G. New targets for therapy in prostate cancer: differential display code 3 (DD3(PCA3)), a highly prostate cancer-specific gene. Urology 2003; 62: 34–43. de Kok JB, Verhaegh GW, Roelofs RW, Hessels D, Kiemeney LA, et al. DD3(PCA3), a very sensitive and specific marker to detect prostate tumors. Cancer Res 2002; 62: 2695–8. Bussemakers MJ, van Bokhoven A, Verhaegh GW, Smit FP, Karthaus HF, et al. DD3: a new prostate-specific gene, highly overexpressed in prostate cancer. Cancer Res 1999; 59: 5975–9. Hessels D, Schalken JA. The use of PCA3 in the diagnosis of prostate cancer. Nat Rev Urol 2009; 6: 255–61. Tinzl M, Marberger M, Horvath S, Chypre C. DD3PCA3 RNA analysis in urine – a new perspective for detecting prostate cancer. Eur Urol 2004; 46: 182–6; discussion 187. Hessels D, Klein Gunnewiek JM, van Oort I, Karthaus HF, van Leenders GJ, et al. DD3(PCA3)-based molecular urine analysis for the diagnosis of prostate cancer. Eur Urol 2003; 44: 8–15; discussion 15-6. Deras IL, Aubin SM, Blase A, Day JR, Koo S, et al. PCA3: a molecular urine assay for predicting prostate biopsy outcome. J Urol 2008; 179: 1587–92. Mehra R, Udager AM, Ahearn TU, Cao X, Feng FY, et al. Overexpression of the long non-coding RNA SChLAP1 independently predicts lethal prostate cancer. Eur Urol 2016; 70: 549–52. Prensner JR, Iyer MK, Sahu A, Asangani IA, Cao Q, et al. The long noncoding RNA SChLAP1 promotes aggressive prostate cancer and antagonizes the SWI/SNF complex. Nat Genet 2013; 45: 1392–8. Petrovics G, Zhang W, Makarem M, Street JP, Connelly R, et al. Elevated expression of PCGEM1, a prostate-specific gene with cell growth-promoting function, is associated with high-risk prostate cancer patients. Oncogene 2004; 23: 605–11. Srikantan V, Zou Z, Petrovics G, Xu L, Augustus M, et al. PCGEM1, a prostate-specific gene, is overexpressed in prostate cancer. Proc Natl Acad Sci U S A 2000; 97: 12216–21. Zhao R, Sun F, Bei X, Wang X, Zhu Y, et al. Upregulation of the long non-coding RNA FALEC promotes proliferation and migration of prostate cancer cell lines and predicts prognosis of PCa patients. Prostate 2017; 77: 1107–17. Prensner JR, Chen W, Han S, Iyer MK, Cao Q, et al. The long non-coding RNA PCAT-1 promotes prostate cancer cell proliferation through cMyc. Neoplasia 2014; 16: 900–8. Liu CM, Hsieh CL, Shen CN, Lin CC, Shigemura K, et al. Exosomes from the tumor microenvironment as reciprocal regulators that enhance prostate cancer progression. Int J Urol 2016; 23: 734–44. Soekmadji C, Russell PJ, Nelson CC. Exosomes in prostate cancer: putting together the pieces of a puzzle. Cancers (Basel) 2013; 5: 1522–44. Bryant RJ, Pawlowski T, Catto JW, Marsden G, Vessella RL, et al. Changes in circulating microRNA levels associated with prostate cancer. Br J Cancer 2012; 106: 768–74. Ahadi A, Brennan S, Kennedy PJ, Hutvagner G, Tran N. Long non-coding RNAs harboring miRNA seed regions are enriched in prostate cancer exosomes. Sci Rep 2016; 6: 24922. Tan MH, Li J, Xu HE, Melcher K, Yong EL. Androgen receptor: structure, role in prostate cancer and drug discovery. Acta Pharmacol Sin 2015; 36: 3-23. Lallous N, Volik SV, Awrey S, Leblanc E, Tse R, et al. Functional analysis of androgen receptor mutations that confer anti-androgen resistance identified in circulating cell-free DNA from prostate cancer patients. Genome Biol 2016; 17: 10. Wadosky KM, Koochekpour S. Molecular mechanisms underlying resistance to androgen deprivation therapy in prostate cancer. Oncotarget 2016; 17: 10. Kinoshita H, Shi Y, Sandefur C, Meisner LF, Chang C, et al. Methylation of the androgen receptor minimal promoter silences transcription in human prostate cancer. Cancer Res 2000; 60: 3623–30. Jarrard DF, Kinoshita H, Shi Y, Sandefur C, Hoff D, et al. Methylation of the androgen receptor promoter CpG island is associated with loss of androgen receptor expression in prostate cancer cells. Cancer Res 1998; 58: 5310–4. Jia L, Berman BP, Jariwala U, Yan X, Cogan JP, et al. Genomic androgen receptor-occupied regions with different functions, defined by histone acetylation, coregulators and transcriptional capacity. PLoS One 2008; 3: e3645. Asangani IA, Dommeti VL, Wang X, Malik R, Cieslik M, et al. Therapeutic targeting of BET bromodomain proteins in castration-resistant prostate cancer. Nature 2014; 510: 278–82. Kahl P, Gullotti L, Heukamp LC, Wolf S, Friedrichs N, et al. Androgen receptor coactivators lysine-specific histone demethylase 1 and four and a half LIM domain protein 2 predict risk of prostate cancer recurrence. Cancer Res 2006; 66: 11341–7. Metzger E, Wissmann M, Yin N, Müller JM, Schneider R, et al. LSD1 demethylates repressive histone marks to promote androgen-receptor-dependent transcription. Nature 2005; 437: 436–9. Berry WL, Janknecht R. KDM4/JMJD2 histone demethylases: epigenetic regulators in cancer cells. Cancer Res 2013; 73: 2936–42. Xu K, Wu ZJ, Groner AC, He HH, Cai C, et al. EZH2 oncogenic activity in castration-resistant prostate cancer cells is polycomb-independent. Science 2012; 338: 1465–9. Jääskeläinen T, Makkonen H, Visakorpi T, Kim J, Roeder RG, et al. Histone H2B ubiquitin ligases RNF20 and RNF40 in androgen signaling and prostate cancer cell growth. Mol Cell Endocrinol 2012; 350: 87–98. Takayama K, Tsutsumi S, Katayama S, Okayama T, Horie-Inoue K, et al. Integration of cap analysis of gene expression and chromatin immunoprecipitation analysis on array reveals genome-wide androgen receptor signaling in prostate cancer cells. Oncogene 2011; 30: 619–30. Ribas J, Ni X, Haffner M, Wentzel EA, Salmasi AH, et al. miR-21: an androgen receptor-regulated microRNA that promotes hormone-dependent and hormone-independent prostate cancer growth. Cancer Res 2009; 69: 7165–9. Malik R, Patel L, Prensner JR, Shi Y, Iyer MK, et al. The lncRNA PCAT29 inhibits oncogenic phenotypes in prostate cancer. Mol Cancer Res 2014; 12: 1081–7. Larne O, Hagman Z, Lilja H, Bjartell A, Edsjö A, et al. miR-145 suppress the androgen receptor in prostate cancer cells and correlates to prostate cancer prognosis. Carcinogenesis 2015; 36: 858–66. Hagman Z, Haflidadóttir BS, Ceder JA, Larne O, Bjartell A, et al. miR-205 negatively regulates the androgen receptor and is associated with adverse outcome of prostate cancer patients. Br J Cancer 2013; 108: 1668–76. Fang Z, Xu C, Li Y, Cai X, Ren S, et al. A feed-forward regulatory loop between androgen receptor and PlncRNA-1 promotes prostate cancer progression. Cancer Lett 2016; 374: 62–74. Wang R, Sun Y, Li L, Niu Y, Lin W, et al. Preclinical study using malat1 small interfering RNA or androgen receptor splicing variant 7 degradation enhancer ASC-J9((R)) to suppress enzalutamide-resistant prostate cancer progression. Eur Urol 2017; 72: 835–44. Zhang Z, Zhou N, Huang J, Ho TT, Zhu Z, et al. Regulation of androgen receptor splice variant AR3 by PCGEM1. Oncotarget 2016; 7: 15481–91. Tsai MC, Manor O, Wan Y, Mosammaparast N, Wang JK, et al. Long noncoding RNA as modular scaffold of histone modification complexes. Science 2010; 329: 689–93. Shtivelman E, Beer TM, Evans CP. Molecular pathways and targets in prostate cancer. Oncotarget 2014; 5: 7217–59. Kaminskas E, Farrell A, Abraham S, Baird A, Hsieh LS, et al. Approval summary: azacitidine for treatment of myelodysplastic syndrome subtypes. Clin Cancer Res 2005; 11: 3604–8. Kantarjian H, Issa JP, Rosenfeld CS, Bennett JM, Albitar M, et al. Decitabine improves patient outcomes in myelodysplastic syndromes: results of a phase III randomized study. Cancer 2006; 106: 1794–803. Mann BS, Johnson JR, Cohen MH, Justice R, Pazdur R. FDA approval summary: vorinostat for treatment of advanced primary cutaneous T-cell lymphoma. Oncologist 2007; 12: 1247–52. VanderMolen KM, McCulloch W, Pearce CJ, Oberlies NH. Romidepsin (Istodax, NSC 630176, FR901228, FK228, depsipeptide): a natural product recently approved for cutaneous T-cell lymphoma. J Antibiot (Tokyo) 2011; 64: 525–31. Gravina GL, Marampon F, Di Staso M, Bonfili P, Vitturini A, et al. 5-Azacitidine restores and amplifies the bicalutamide response on preclinical models of androgen receptor expressing or deficient prostate tumors. Prostate 2010; 70: 1166–78. Fialova B, Luzna P, Gursky J, Langova K, Kolar Z, et al. Epigenetic modulation of AR gene expression in prostate cancer DU145 cells with the combination of sodium butyrate and 5'-Aza-2'-deoxycytidine. Oncol Rep 2016; 36: 2365–74. Graça I, Sousa EJ, Baptista T, Almeida M, Ramalho-Carvalho J, et al. Anti-tumoral effect of the non-nucleoside DNMT inhibitor RG108 in human prostate cancer cells. Curr Pharm Des 2014; 20: 1803–11. Viola-Rhenals M, Patel KR, Jaimes-Santamaria L, Wu G, Liu J, et al. Recent advances in antabuse (Disulfiram): the importance of its metal-binding ability to its anticancer activity. Curr Med Chem 2018; 25: 506–24. Vardi A, Bosviel R, Rabiau N, Adjakly M, Satih S, et al. Soy phytoestrogens modify DNA methylation of GSTP1, RASSF1A, EPH2 and BRCA1 promoter in prostate cancer cells.In Vivo 2010; 24: 393–400. Singal R, Ramachandran K, Gordian E, Quintero C, Zhao W, et al. Phase I/II study of azacitidine, docetaxel, and prednisone in patients with metastatic castration-resistant prostate cancer previously treated with docetaxel-based therapy. Clin Genitourin Cancer 2015; 13: 22–31. Thibault A, Figg WD, Bergan RC, Lush RM, Myers CE, et al. A phase II study of 5-aza-2'deoxycytidine (decitabine) in hormone independent metastatic (D2) prostate cancer. Tumori 1998; 84: 87–9. Knutson SK, Wigle TJ, Warholic NM, Sneeringer CJ, Allain CJ, et al. A selective inhibitor of EZH2 blocks H3K27 methylation and kills mutant lymphoma cells. Nat Chem Biol 2012; 8: 890–6. McCabe MT, Ott HM, Ganji G, Korenchuk S, Thompson C, et al. EZH2 inhibition as a therapeutic strategy for lymphoma with EZH2-activating mutations. Nature 2012; 492: 108–12. Qi W, Chan H, Teng L, Li L, Chuai S, et al. Selective inhibition of Ezh2 by a small molecule inhibitor blocks tumor cells proliferation. Proc Natl Acad Sci U S A 2012; 109: 21360–5. Wu C, Jin X, Yang J, Yang Y, He Y, et al. Inhibition of EZH2 by chemo- and radiotherapy agents and small molecule inhibitors induces cell death in castration-resistant prostate cancer. Oncotarget 2016; 7: 3440–52. Zhao Y, Yang CY, Wang S. The making of I-BET762, a BET bromodomain inhibitor now in clinical development. J Med Chem 2013; 56: 7498–500. Asangani IA, Wilder-Romans K, Dommeti VL, Krishnamurthy PM, Apel IJ, et al. BET bromodomain inhibitors enhance efficacy and disrupt resistance to AR antagonists in the treatment of prostate cancer. Mol Cancer Res 2016; 14: 324–31. Gianluca C, Silvia P, Sara A, Antonina B, Domenico A, et al. Abstract 2625: targeting prostate cancer stem cells (CSCs) with the novel BET bromodomain (BRD) protein inhibitor OTX015. Cancer Res 2015; 75: 2625. [doi: 10.1158/1538-7445.AM2015-2625]. Sorna V, Theisen ER, Stephens B, Warner SL, Bearss DJ, et al. High-throughput virtual screening identifies novel N'-(1-phenylethylidene)-benzohydrazides as potent, specific, and reversible LSD1 inhibitors. J Med Chem 2013; 56: 9496–508. Ueda R, Suzuki T, Mino K, Tsumoto H, Nakagawa H, et al. Identification of cell-active lysine specific demethylase 1-selective inhibitors. J Am Chem Soc 2009; 131: 17536–7. Willmann D, Lim S, Wetzel S, Metzger E, Jandausch A, et al. Impairment of prostate cancer cell growth by a selective and reversible lysine-specific demethylase 1 inhibitor. Int J Cancer 2012; 131: 2704–9. Etani T, Suzuki T, Naiki T, Naiki-Ito A, Ando R, et al. NCL1, a highly selective lysine-specific demethylase 1 inhibitor, suppresses prostate cancer without adverse effect. Oncotarget 2015; 6: 2865–78. Rotili D, Tomassi S, Conte M, Benedetti R, Tortorici M, et al. Pan-histone demethylase inhibitors simultaneously targeting Jumonji C and lysine-specific demethylases display high anticancer activities. J Med Chem 2014; 57: 42–55. Takahara K, Ii M, Inamoto T, Nakagawa T, Ibuki N, et al. microRNA-145 mediates the inhibitory effect of adipose tissue-derived stromal cells on prostate cancer. Stem Cells Dev 2016; 25: 1290–8.